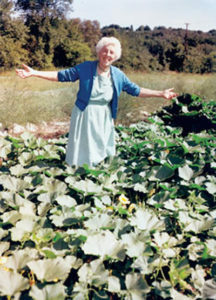 Mulch gardening is a system popularized by Ruth Stout. Stout was born in 1884 and lived until 1990. She was an outspoken free spirit, a woman we would describe as "before her time". While the name Gertrude Jekyll evokes visions of generous, undulating borders filled with jewel-colored plants, Stout's name evokes a garden covered with a carpet of spoiled hay with rows of green vegetables peeking through here and there. Stout was able to feed her husband and herself year round from a patch of ground that was described as 45 x 50. She cooked daily from the garden, canned and preserved any excess, saved and replanted seed, and allowed volunteers, which she replanted as she liked. Stout's method was labeled "mulch gardening" because it was basically a system of establishing and maintaining a permanent layer of mulch that was never tilled under. All planting was done directly into the mulch, or in rows made by pulling the mulch back a bit. Stout used only cottonseed meal or soybean meal as a supplemental fertilizer. The plants were supported by soil that was continually enriched by the decomposing mulch layer. Mulch gardening should not be confused with mulching around plants. In mulch gardening, the mulch layer becomes the permanent planting layer. The method is also referred to as "sheet composting". There are small differences between mulch gardening and sheet composting, but the differences are not significant and the terms are often used interchangeably. 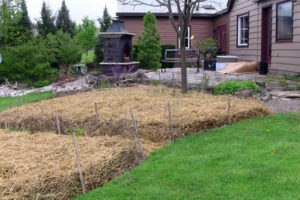 Like Patricia Lanza and her 'Lasagna Gardening' system, Stout was not the first to discover and use a no-till, permanent cover gardening method. Their styles and materials differ a bit, but the principle is the same. Both women deserve a lot of credit. 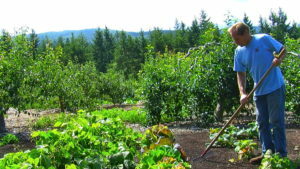 Today, the permanent mulch method is included in the permaculture design philosophy. Stout's books are out of print, but a few copies are available from used book dealers. Some original interviews with Stout have been digitized and uploaded to YouTube. Her articles were printed in several different publications, and some are still available in internet versions. Her method was included in the Rodale Press book 'How to Grow Vegetables & Fruits by the Organic Method', published in 1961. My own very worn copy is still an occasional reference. The newest form of mulch gardening to take hold in the gardening world is Paul Gautschi's 'Back to Eden' style. (Paul Gautschi's Story). Where Stout utilized spoiled hay, Gautschi uses wood mulch. You will hear many of the same words used by both Stout and Gautschi - no tilling, no weeding, no watering, little fertilizer use. The claims made by Stout and Gautschi are not without merit. Mulch gardening works. In the Gulf Coast garden, each material comes with a caveat. But once you take that into consideration, I would not hesitate to encourage you to try mulch gardening. I use it in my own garden and love it. Stout preferred spoiled hay. She was a very practical woman, and used what was available and economical. In Stout's day, it was less common for a hay grower to use herbicides on his fields. It is so common today that it is difficult to find commercial hay that has not come from treated fields. The herbicide used on hay crops (usually picloram) has a long residual. It can decimate a vegetable garden in short order. Symptoms appear quickly after application. Additionally, the chemical can survive the digestive tract of livestock and end up in their manure. It even survives composting. The chemical leaches into the soil where it can take 3 - 4 years to degrade. Unless you know the hay grower, and can confirm that the hay has not been treated with a herbicide, I would avoid it in the garden. There is just too much risk of harm, and there are other ways to mulch garden without taking that chance. I know several gardeners who have watched the 'Back to Eden' story, enthusiastically hauled and spread yards of wood mulch, and planted their veggie gardens, only to be disappointed with the results. The only mistake they made is TIME. would be be tter. Wood chips, even from native mulch, need a bit of time to start decomposing enough to do all of the wonderful things that 'Back to Eden' promotes. I would not plant into the wood mulch layer until I was ready to add the refreshing layer in the second year. In addition, not all wood chips are created equally. Be sure you are not buying ground up construction waste or storm dead-fall. These mulches can cause more harm than good in the vegetable or fruit garden. Invest in good quality native mulch and be ready to wait before planting. My mulch of choice is tree leaves. I lay down a suppression layer of cardboard and/or newspaper, apply leaves thickly over the top (as much as 12"), broadcast dried molasses and slow release organic fertilizer, and leave it alone for a few months. It does not take long for the leaves to make a wonderful mulch garden.